Our Thanksgiving Feast included these crunchy, salty & sweet morsels. There wasn’t much leftover, but what wasn’t gobbled up for lunch my sister and I polished off the next morning for breakfast. Cold. Make them for Christmas or heck for go crazy and make them for breakfast with some scrambled eggs. Cook the pancetta until crisp in a large skillet. Remove using a slotted spoon, and drain on paper towels. Reserve 1/4 cup drippings in the skillet. Combine the Brussels sprouts, olive oil and salt in a large bowl. 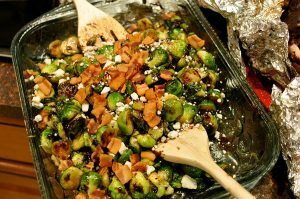 Place the sprouts on the prepared baking sheet and bake until tender, about 20 minutes. Add the vinegar, brown sugar and mustard to the reserved bacon drippings in the skillet. Cook over medium-high heat, stirring frequently, until the mixture is reduced by half, about 6 minutes. Pour the mixture over the sprouts, tossing gently to coat. Sprinkle with the bacon & blue cheese Serve immediately. It’s impossible to go wrong with a crispy pizza like crust layered with cheese, caramelized onions & bacon. The Tarte Flambée is a regional specialty of Alsace, France and when done the right way can take some time. Making the dough, waiting for it to rise and caramelizing the onions is a slow process. However, it can all be done a day ahead at the least (cook the bacon, caramelize the onions and proof the dough and store in the fridge). It was worth every minute – absolutely delicious! For the dough: Activate the yeast by combining the lukewarm water, yeast and sugar. Stir together and let sit until the mixture becomes frothy and foamy and smells very yeasty, about 10 minutes. Put the flour in a mixing bowl and make a well in the center. Add the olive oil, salt and the activated yeast mixture. Stir until the dough comes together and forms a ball. Dust a clean work surface with flour and knead the dough until it is tight and firm, 5 to 7 minutes. Place the dough back in the mixing bowl, cover the bowl with plastic wrap and let sit in a warm place until the dough has doubled in size, about 1 hour. For the topping: Preheat the oven to 400 degrees F.
Place the bacon in a large, wide pan and give it a couple drops of olive oil. Bring the pan to a medium heat and cook the bacon until it is brown and crispy. Remove the bacon from the pan and reserve on paper towels. Add the onions to the pan, season with salt, cover and cook until the onions have wilted and are very soft, about 10 minutes. Remove the lid and cook the onions until they are very soft and caramelized. This will take awhile, maybe up to 45 minutes. Stir the onions occasionally paying attention not to let them burn, but don’t rush it! When the onions are really brown and sweet, remove them from the heat and reserve. Combine the creme fraiche and fromage blanc. Divide the dough into 4 even balls and roll them out until they are 1/8 to 1/16-inch thick. Place them on a sheet tray and bake them in the oven for 4 minutes. Remove the dough from the oven. 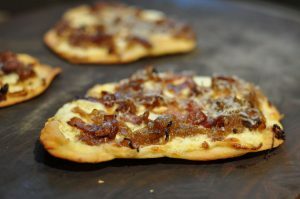 Smear each dough evenly with the cheese mixture, place an even layer of the caramelized onions on the cheese and sprinkle the bacon on top of the onions. Top with freshly grated Parmesan cheese. Return the dough to the oven until the dough is crisp on the bottom and the toppings are bubbly, 6 to 8 minutes. Sprinkle with chives and serve.